Every once in a while, I buy tofu and most of the time it ends up as tofu bhurji. This time when I bought it, I wanted to try something else with it like chilli tofu or in some baking but then it finally ended up in this kurma. 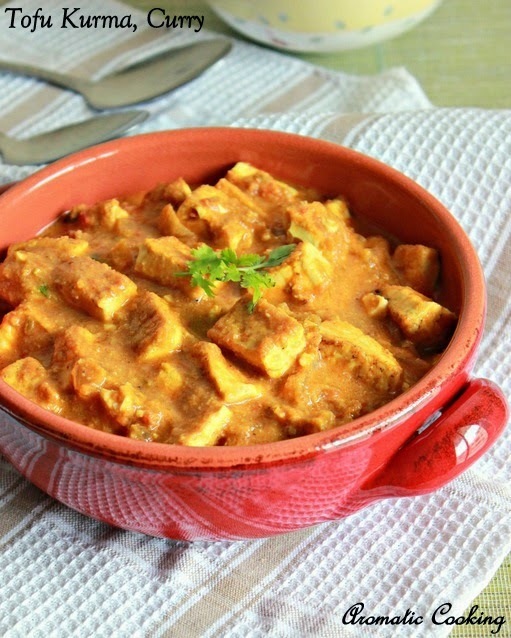 This is again an easy dish, goes perfectly with rotis, naans and pilafs and a nice healthy alternative to a paneer dish.. Grind together all the ingredients given under ' Paste 1 ' and ' Paste 2 '. Shallow fry the tofu pieces till golden, drain the excess oil and keep. Heat some oil, add the cinnamon and cloves, when it starts sizzling, add the chopped onion and saute for 2 minutes, then add the Paste 1 along with the chilly, coriander,turmeric powders and salt and saute well for 5 to 7 minutes till the raw smell of garlic and onion goes away and you get a nice aroma. Now add the Paste 2 and saute for a minute or two. Then add the tofu pieces and about 1 to 11/2 cups of water and cook for another 3 to 5 minutes, then add the garam masala, mix and finally add the chopped coriander and remove. 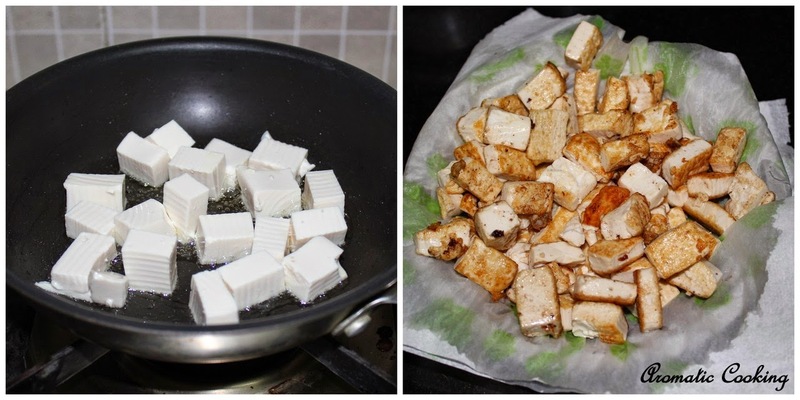 For easy frying, shallow fry big pieces of tofu and then dice it. Add more or less coconut according to your preference and adjust the spices and tomatoes according to that. 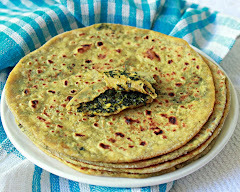 perfect side dish for roti,looks inviting!! 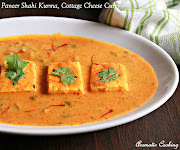 perfect like paneer butter masala,yummy!!! 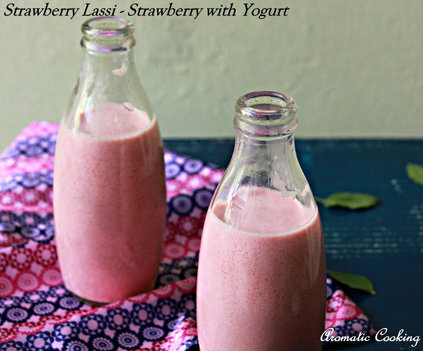 looks delicious, will go great with rotis. 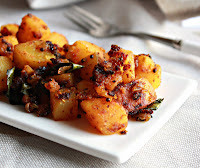 Very healthy and flavorful side dish.. looks awesome!! 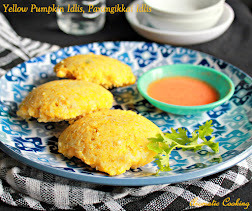 Irresistible side dish, can have it happily with some rotis.. So delicious, healthy and full of flavours! 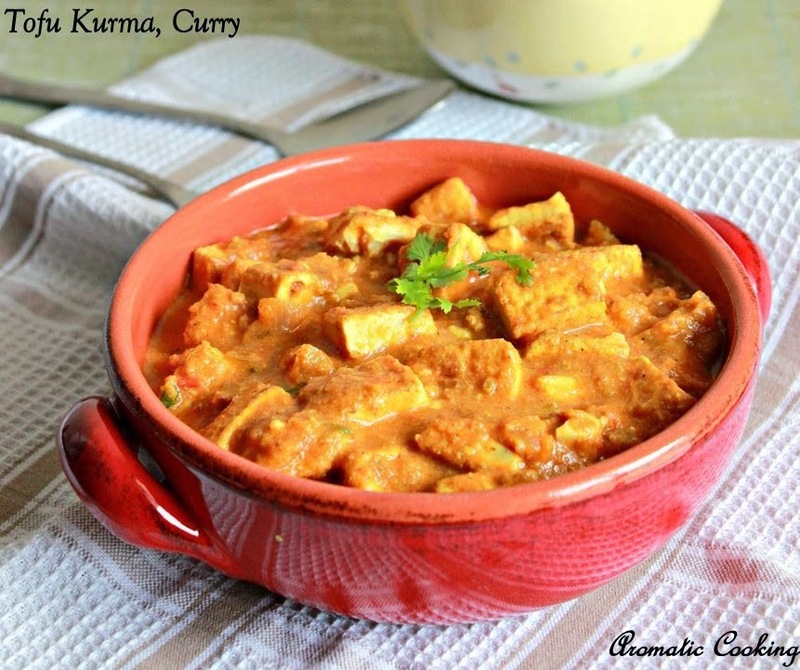 Tofu kurma looks delicious love to try it. Great dish; I should start using tofu more! delicious kurma , looks inviting..